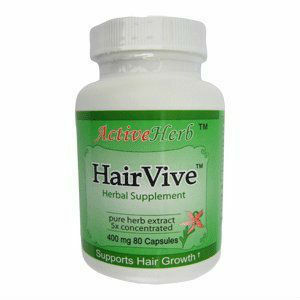 This is a review of the supplement Active Herb’s HairVive. The makers of this product claim it supports the regrowth of hair as well as restoring the color to hair. To learn more about the ingredients in this product keep reading here. Every ingredient in this product is considered to be important. All of the extracts are pure with higher concentrations meaning more potency. For consumer safety, only top quality materials are used. Two capsules should be taken from two to three times each day. For the best results doubling up on the dose is recommended, making the amount taken to two capsules up to six times each day. The website claims to have few people who have experienced adverse reactions to this product which is completely herbal with no added dyes, sugars, or chemicals of any kind. If one has an allergy to any one of the ingredients this is not a product they should take. It is also advised by the website to take this product with precaution if currently having problems with diarrhea, vomiting, a cough with a lot of phlegm, or a distended abdomen. It is not recommended to take this product if you are taking cold medicines. It is also not recommended to eat oily foods as you use this product. Allergic reactions are rash, dizziness, and trouble breathing, if you have any of these reactions discontinue use immediately and see your physician. There are sixty capsules in each bottle of HairVive. The price for a single bottle is $13.98 but you can get a discounted price if you purchase six or more bottles at one time. The discounted price is $11.66 a bottle, that’s a savings of 16%, and $2.32 a bottle. You will have to add shipping and handling charges which are $5.50 unless your purchase totals over $40.00, then its free. There is a thirty day full refund guarantee. This does not include shipping charges. Furthermore if more than one bottle was purchased, only one bottle can be opened, and the remaining bottles must remain sealed in their original state and ready to be re-sold (no writing can be on any of the bottles) or no money will be returned. The capsules used for HairVive are vegetable based so they are considered vegetarian friendly. They are also gluten free, making them ideal for those who suffer from gluten allergies. Being completely natural makes this supplement for hair regrowth safe. The website showed many of the customers happy with their purchase and the results the product gave them. Negative feedback, consisted of complaints of little results to no results. The dosage is somewhat unclear as the manufacturer says you can take anywhere from two to six capsules each day. John Brownstone	reviewed ActiveHerb HairVive	on August 3rd	 and gave it a rating of 3.